The Netflix original movie empire continues to grow and more and more it feels like they're doubling down on tickling the fancies of "millennials" (regardless of how you choose to define that term) and thus we get more content like this. Whew. 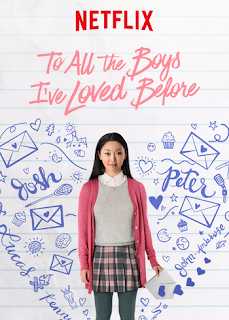 I decided to give To All The Boys I've Loved Before a bit of a chance since (1) Tobie tends to like romantic comedies and (2) too many people in my Twitter circles were either talking about the movie or quoting the movie. That can get pretty annoying and so I wanted to stop that sort of spoilery behavior even for a movie I had no original interesting in watching. To be fair, this is a movie based on an already popular (?) book and that helps make it a safer investment than some of Netflix's other original ventures. And if the social media chatter is any measure, it seems they were successful in reaching their target demographic. Largely I felt the movie was just okay. 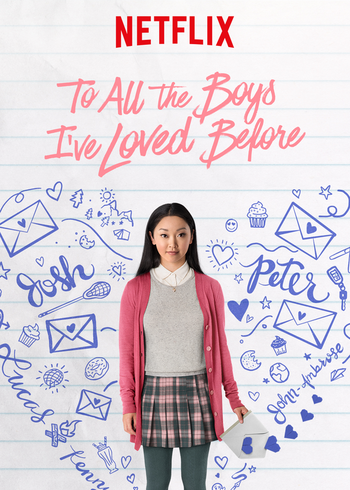 Synopsis: To All The Boys I've Loved Before is an American teen romance movie directed by Susan Johnson. The screenplay was written by Sofia Alvarez based on the book by the same name written by Jenny Han. Lara Jean Song Covey (Lana Condor) is a 16 year old who has long fantasized about finding the perfect guy but never really working up the nerve to explore possible relationships. The best she has been able to do is to write these lengthy love letters to her various crushes and infatuations over the year but never sending the letters. And thus her affections continue to go unrequited mainly because she never asks the question, if you get what I mean. All that changes when her younger sister Kitty (Anna Cathcart) decides to take matters into her own hands and sends out the five love letters to their intended recipients. One of the trickier members of this virtual harem is Josh (Israel Broussard), her old sister Margot's (Janel Parrish) boyfriend. And when she first gets approached by Peter (Noah Centineo), her crush in the seventh grade, it's only then that it dawns on her that the letters have been sent out. But in convoluted movie logic, Peter suggests the two of them work together so that he can make his ex-girlfriend jealous and possibly to get Josh interested in her now that Margot has gone away for college. What I Liked: As is the nature of books turned into movies, this movie has some great one-liners and various bits of extended dialog. It's a movie that has value for furthering the cause of representation in American movies and does this without needing to shout about the culture and all that jazz. And no, the "Korean yogurt" bit was not shouting since Yakult is Japanese and not Korean. There was a decent amount of on-screen chemistry between the different characters and that's rather essential for movies with a romantic angle to it. But I think Lana Condor's performance was especially poignant as it was pretty easy to feel all of her emotional ups and downs in this emotional journey. What Could Have Been Better: Beyond that, the movie just felt very middle of the road for me as a lot of the plot points were rather predictable. If anything it was super obvious that Josh was never going to be a valid love interest for Lara because they never bothered to show him much beyond the initial interludes nor did he get much plot development beyond Lara telling viewers that they were like best friends. The story just felt like a lot of different things that just happened one after the other with witty lines or quotable quotes holding the different scenes together somehow. I wanted to appreciate this movie more but really it had little to no actual conflict and the stuff at the end felt rather forced and demanded by the plot. Thus it remains safe but therefore also unremarkable as a movie. TL;DR: To All The Boys I've Loved Before is what happens when a penny romance book becomes a movie. It's not a terrible movie and it certainly has its charm, but at the same time it just isn't that remarkable in order to stand out either. Thus the movie gets a decent 3 unsent love letters out of a possible 5.